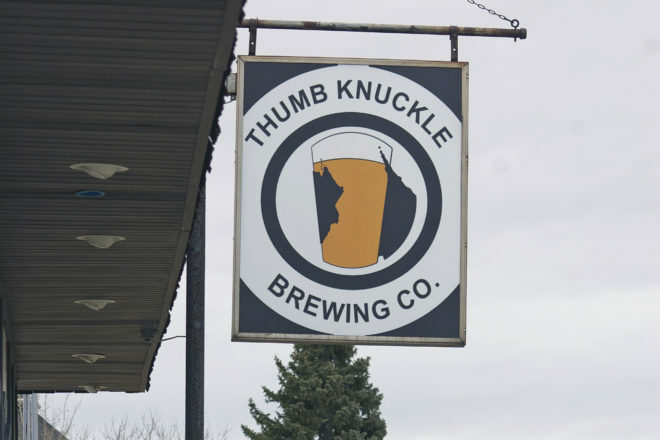 Beer started flowing at noon on March 18 at Wisconsin’s newest craft brewery, Thumb Knuckle Brewing in the unincorporated Kewaunee County community of Walhain, about two miles west of Luxemburg on Hwy. 54. Sure, you’re wondering about the Thumb Knuckle name. 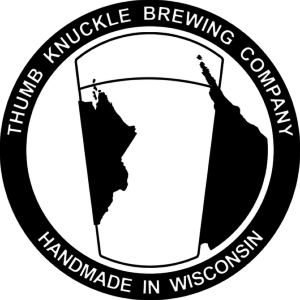 The brewery’s logo says it all – the state of Wisconsin has been turned into a hand grasping a pint. The peninsula is the thumb, and the brewery is at the thumb’s knuckle. “We’re all about being handmade,” said Ed Thiry, adding that included designing and building the brewery and taproom with a lot of help from family and friends. Thiry opened the business with Dain Treml, his best friend since third grade. They grew up together in the Luxemburg-Casco area. Their final step on the road to commercial brewing had Thiry spend 18 months working at a German brewery, Brauereigenossenschaft Taufkirchen, learning to brew on a big system. Thumb Knuckle opened serving three beers in its 77-person taproom – Boat Load IPA, a Belgian wit with orange peel and coriander called Belgian Beauty, and a delicious lightly smoked porter called Gunmetal Smoked Porter. Thiry said they also have Hey Der Helles, a German-style lager that is still in the lagering tank but should be available in about a month. “In general, we just want to be known for good, handmade beer. There’s no particular style that is our signature beer as of yet,” Thiry said. When the weather warms, there will be seating outside and a beer patio. The taproom is open Wednesday through Friday from 3 to 8 pm, noon to 8 pm on Saturdays and noon to 5 pm on Sundays.